The Department of Justice announced Friday that it will retry Sen. Bob Menendez (D., N.J.) on federal corruption charges after the case ended last year in a mistrial. The department has charged Menendez with 12 counts of corruption, filing a brief in Newark, New Jersey federal court to announce its plan, the New York Times reports. Six of the counts against Menendez are for bribery, three are for honest services fraud, and his close friend Salomon Melgen is again a co-defendant in the trial. "The United States files this notice of intent to retry the defendants and requests that the Court set the case for retrial at the earliest possible date," the brief reads. "Defendants Robert Menendez and Salomon Melgen have been indicted for bribery and corruption by two separate grand juries properly empaneled in the District of New Jersey." Prosecutors allege the wealthy Florida eye doctor bribed Menendez with private jet flights and various other gifts in exchange for government favors. 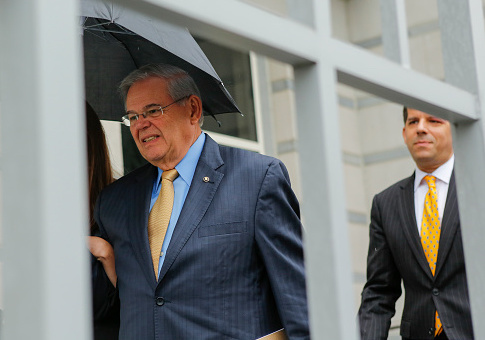 Jurors last year were deadlocked on charges against both Menendez and Melgen, leading the judge to declare a mistrial. Menendez has maintained his innocence and even declared his mistrial in November to be deliverance from "unjust prosecution." He is also up for reelection in 2018, and has not announced any plans to retire. Meanwhile, his Democratic colleagues have continued to support him. Aknowledging the department had not rescinded its charges, Menendez in December said, "if you want to prosecute, bring it on." This entry was posted in Politics and tagged Bob Menendez, New Jersey, Senate Democrats. Bookmark the permalink.